I often recommend a product called GB-3, from Endomet Labs. This product is a combination of ox bile, pancreatin, and Russian Black Radish. 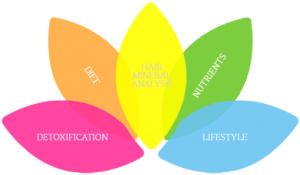 This article describes why this particular product, or something very similar, is very important in nutritional balancing science at this time. GB-3 is an excellent digestive aid because of its content of pancreatin and ox bile, primarily, which are digestive enzymes. Most people need this type of digestive support at all ages, but particularly those over age 50 or so and anyone who is ill or has lowered vitality. However, GB-3 offers more than this. The dehydrocholic acid also helps acidify the intestine, which is also helpful. The combination of the ingredients also helps stimulate bile production, perhaps, which also enhances digestion. Removing parasites, debris and other pathogens in the intestines. Most people today have some degree of intestinal dysbiosis. This means the presence of infections, yeasts, parasites and other flora or micro-organisms in the intestines that are not ideal. GB-3 will help kill many of these. If it happens too quickly, one will get diarrhea from the product and must start with less of it, even just one-half a tablet daily until the intestine is cleared and one can handle more of it. This is a great advantage of this product, because it replaces a wide range of products that other doctors must use to clear candida albicans, parasites and other abnormal bowel organisms. While GB-3 does not always do the job, in most cases it works beautifully, while it accomplishes all the other tasks described in this article. Thus is saves money, time and effort for the client. Balancing yin and yang is a concept that Dr. Eck did not subscribe to, at least not in terms of the diet and supplements. However, I have added it to his programs and it appears to make the programs much more effective in some cases. As part of this concept, GB-3 is far more yang in Chinese medical terminology than either hydrochloric acid and pepsin or vegetable enzymes, herbal digestive aids, or others. The reason is that GB-3 contains more animal quality substances than the others, and due to the qualities of the individual ingredients. This is an advantage in most all cases, as most bodies today are too yin in Chinese terminology. Balancing this yin quality with the correct type of supplements appears to greatly enhance the restoration of health of the intestines compared to using betaine HCl-pepsin, vegetable enzymes or other digestive aids. The concept of balancing yin and yang in healing is very advanced and a wonderful concept. It is similar to acupuncture, which Dr. Eck deeply respected. For more on this topic, read Yin And Yang Healing on the Center for Development website. Another important aspect of nutritional balancing programs, especially those that I use now, is to correct the balance of the autonomic nervous system. This is Dr. Eck’s concept and I feel that I now understand it better than I did about 15 years ago when he was alive. Most people have exhausted their sympathetic or fight-or-flight nervous systems. Most have fallen into a parasympathetic state of slow oxidation. However, many are yet what we call sympathetic dominant. This means they retain the mental patterns such as fear and worry that pushed them into an exhaustion state. Therefore, they will benefit from any method that helps to relax the sympathetic nervous system. GB-3 is what I call a parasympathetic supplement compared to other digestive aids such as BetaineHCl-pepsin. Pancreatin, dehydrocholic acid, ox bile and Russian black radish all inhibit the sympathetic nervous system, helping it rest and rebuild. Other parasympathetic products include calcium, magnesium, zinc, selenium, thymus, kidney, liver and pancreas glandulars, L-taurine and GABA. So using GB-3 is better for this important reason as well. Based on national health statistics, about half of all Americans will be diagnosed with cancer at some time in their lives. According to medical studies, on average one has had cancer three to five years before it is diagnosed. If the cancer can be stopped at an extremely early, pre-clinical stage, it is far easier to heal. Pancreatic enzymes such as pancreatin and perhaps found also in ox bile can help destroy cancer cells. This was discovered by Dr. John Beard, author of The Trophoblastic Theory of Cancer. The use of pancreatic enzymes is the cornerstone of the Kelley enzyme treatment for cancer. This program has been available for some years and can produce excellent results. Taking GB-3 regularly provides an inexpensive, low-potency way to perhaps help prevent or even remove some cancer from the body. I do not mean that GB-3 is a “cancer cure” by any means. However, it may be a helpful preventive and that is all. It is a simple step that never hurts and fits our paradigm of preventive health care through nutrition. Russian black radish is a copper antagonist herb. Russian black radish also enhances the oxidation rate a little. GB-3 as a parasympathetic and yang product helps enhance the oxidation rate. Fast oxidizers also do well on GB-3, although they often require some copper for a while. Dr. Eck gave more GB-3 to fast oxidizers because they need it for fat digestion, whereas he gave betaine hydrochloride and pepsin to slow oxidizers for protein digestion as the need more protein. However, GB-3 actually helps both types of digestion, since pancreatin is a proteolytic or protein-digesting enzyme. Also, slow oxidizers need the fat digesting enzymes as well. With the proliferation of toxic chemicals and toxic metals in the environment, most everyone has a toxic liver to some degree. Slow oxidizers, in particular, develop sluggish liver activity due to weak adrenal and thyroid glandular activity. GB-3 is an excellent liver support formula that helps the body eliminate many toxic metals and chemicals from the liver. Upon starting GB-3, some people report diarrhea, intestinal cramps or stomach upset. This occurs because pancreatin and ox bile digest candida organisms, parasites, bacteria and debris in the intestines. The solution is to reduce the dosage at first, as low as 1/2 tablet per day, and then slowly increase the dosage. The stomach discomfort usually passes within a few months. Fillers, binders and other aspects of this product. We get excellent results with GB-3. I look for toxicity from any ingredients and have not found any, as yet. GB-3 contains some magnesium stearate, which I checked on the web after reading Dr. Mercola’s information. I also called the company that manufactures the product. They informed me that their magnesium stearate does not contain hydrogenated oils, as many web sites claim it does. It is also non-toxic and is not a problem, as some people claim. We have never experienced a problem from this ingredient. To order GB-3: You may purchase it directly through Endo-met Laboratories.A large bottle of 180 tablets will last two months if you take one per meal, and one month if you take two per meal, which is better.